Please note that, due to its content, readers may find this article distressing. I had been kidnapped by depression and killed. A couple of months ago my friend died by suicide. A vivacious, kind and gentle guy, he was one of the six thousand people who kill themselves every year in the UK (Samaritans, Suicide Statistics Report 2015). Every such death affects on average 10-15 people, including family, friends, neighbours and work colleagues (Dyregrov, 2011). Even though the poet Gwyneth Lewis, cited at the beginning of this article, did not attempt a suicide, depression is a major contributor to lethal self-injury. In fact, suicidality is one of the symptoms of this illness. Most of us can probably imagine how loss of hope and prolonged despair can make us want to escape life. However, not all depressed people desire death; among those that do, only about half will attempt to take their lives (May et al., 2012). Depression and hopelessness are major predictors of suicide. Why is it then that people kill themselves? 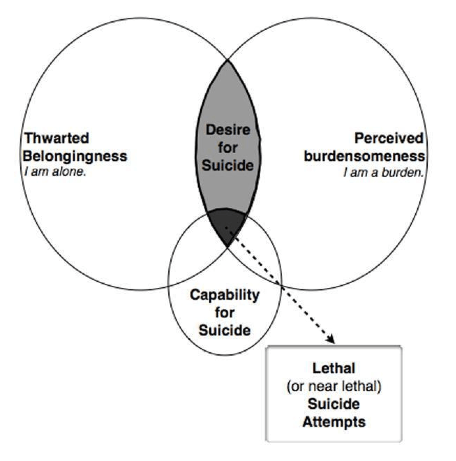 According to the interpersonal theory of suicide it is because of the combination of three factors: thwarted belongingness, perceived burdensomeness, and the capability for lethal self-injury (Joiner, 2005; Van Orden et al., 2010). Thwarted belongingness is a subjective feeling of being disconnected from others, loneliness and lack of mutual care: “I have no one to turn to”, “I am not a support for others”. For example, prisoners kept in single cells are more likely to attempt a suicide. Thwarted belongingness does not necessarily mean that we truly do not belong; it could just be the case of interpreting the behaviour of others as rejecting. The second factor, perceived burdensomeness, is the feeling that we are a burden to others. It arises from self-hatred and from the belief that we are inadequate, that we let others down and therefore our family and friends will be better off without us: “I make things worse for the people in my life”, “I am useless”. Perceived burdensomeness plays an important role in suicides of terminal cancer patients. Of course, the subjective feeling of being a burden, or being ‘expendable’ does not mean that others also see us as a burden; often it is part of a distorted view of the self and others. 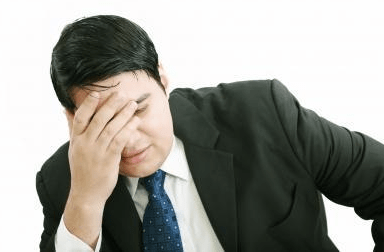 Such bias towards negative signals and the perception that we are ‘stuck’ can be remedied with cognitive-behavioural therapy, which helps us to restructure the way we interpret information, how we make sense of the world and how we approach problems. Thwarted belongingness and perceived burdensomeness, accompanied by loss of hope, together create the desire to die (suicidal ideation). However, in order to complete a suicide we also need the capability for lethal self-injury. In other words, people kill themselves not only because they want to, but also because they can; after all, suicide is painful and violent, and therefore very difficult to carry out. The interpersonal theory proposes that self-killing becomes easier if we lose our fear of death and if we are less sensitive to pain. This is why previous attempts, as well as previous experience of violence make us more likely to die by suicide. However, the capability for lethal self-injury also increases with increased access to information about suicide and the means to complete it. For example, military people, when choosing a mean of suicide attempt, opt for the method they have been exposed to: members of the army prefer guns, those in the navy – hanging and air force individuals – falling from heights. Consider also the phenomenon of suicide contagion (Wray, 2012). It has also been termed the Werther effect after the suicide of the main character in the famous novel by Goethe led to a wave of copy-cat deaths. Golden Bridge in the US attracts suicidal people from all over the country and from abroad. Kevin Berthia was one of the two hundred people coaxed back from its railings by a police officer. He chose the bridge for the ease of death it offered. He also admitted that erecting a suicide net under the bridge would definitely discourage him from jumping. Van Orden et al., 2010. Assumptions of the Interpersonal Theory of Suicide. The interpersonal theory of suicide can help explain the links between lethal self-injury and age, as well as some personality aspects. Loss of health and independence, sometimes combined with limited financial means puts older people at greater risk of ending their lives (Jahn and Cukrowicz, 2011). This is because having to rely on the help of others, especially children and grandchildren, makes older people feel that they are a burden. Perceived burdensomeness also appears to be important in linking perfectionism with suicidal tendencies (Rasmussen et al., 2012). Perfectionist individuals tend to set themselves standards which are so high that it is often impossible for them to reach their own expectations. As a result they may fall prey to feelings of incompetence, self –blame and inadequacy, and start to see themselves as a burden on others. On the other hand, it has been shown that mindfulness as a personality trait can help prevent suicide in veterans (Serpa et al., 2014). Mindfulness is an awareness of present moment with non-judgemental attention, almost the opposite of rumination and worry. It makes it easier to cope with negative emotions, alleviates the severity of mental illness and reduces the risk of suicide. The interpersonal theory of suicide provided me with a partial explanation for my friend’s death. Ending one’s life is said to be the permanent solution to the temporary problems; the sense of hopelessness blinds us to the fact that no matter how bad things are, nothing lasts forever. Sometimes it takes a while to find the right treatment or the right approach to help those in despair. However, mindfulness and cognitive-behavioural therapy are only some of the treatments that can be tried and that work for many people. Perhaps we should also come up with effective ways to teach ourselves and our children how to better manage our emotions, look after our psychological selves and how to find meaning in life. If you or someone you know needs help, contact Samaritans at 0845 790 9090. Dyregrov, K. (2011). What do we know about needs for help after suicide in different parts of the world? A phenomenological perspective. Crisis, 32(6), 310–318. Joiner, T.E. (2005) Why people die by suicide. Cambridge: Harvard University Press. Lewis, G. Sunbathing in the rain. A cheerful book about depression. Rasmussen, K.A., Slish, M.L., Wingate, L.R., Davidson, C.L., Grant, D.M. (2012) Can Perceived Burdensomeness Explain the Relationship Between Suicide and Perfectionism? Suicide and Life-Threatening Behavior 42(2): 121-128. Serpa, J.G., Taylor, S.L., Tillisch, K. (2014) Mindfulness-based stress reduction (MBSR) reduces anxiety, depression, and suicidal ideation in veterans. Medical Care 52(12 Suppl 5):S19-24. doi: 10.1097/MLR.0000000000000202. A Closed Door or an Open Window? We need to change about suicidal thoughts for everyone.